The Government of Gujarat has established “RAKSHA SHAKTI UNIVERSITY” vide ‘The Raksha Shakti University Act, 2009’, Gujarat bill No-16 of 2009 in the sixtieth year of the Republic of India to prepare the youth of the state for becoming effective and efficient security personnel and to conduct courses and award degrees, diplomas and certificate for the said purpose. This university is dedicated for developing skill in field of internal development, and future employees in internal Security Management sector. The Raksha Shakti University is a unique and first of its kind in India for conducting certificate, diploma and degree courses in the field of police science and internal security. Till the new University building becomes operational, the activities and the University will be carried out from the old SPIPA building situated at Meghaninagar, Ahmedabad. You will do payment by credit/debit/net banking. If you don't want to do online payment then you will do offline payment by bank challan/DD/cash(in university). If you will choose bank challan or DD then you have to submit original copy of DD or bank challan with form in university. Candidates who are interested in taking admission to “Three Months Certificate Course in Photography” of Raksha Shakti University are requested to go through the eligibility criteria carefully before applying. 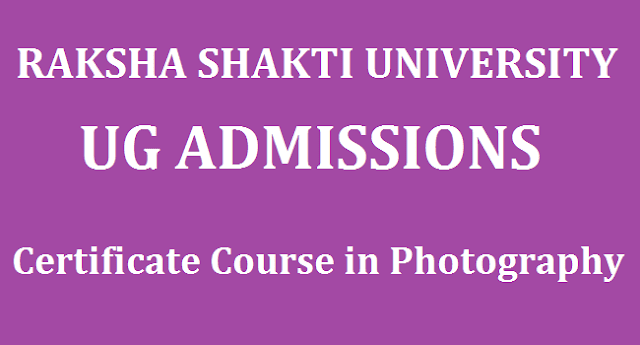 The intending applicants should download the Course’s application form from the Raksha Shakti University website: www.rakshashaktiunivesity.edu.in and the duly filled in application, along with cash in person/D.D./Cheque for Rs.100/- as application form fee in favour of Registrar, Raksha Shakti University, Ahmedabad – 380016 and should be submitted in to the Registrar, Raksha Shakti University, Meghaninagar, Ahmedabad – 380016 latest by 30/06/2017 up to 4.00 pm on working days. Along with the application the candidate should attach self-attested Xerox copy of certificates, No objection Certificate (NOC) from the current employer. (If applicable) Counselling and admission schedule will be done on 30/06/2017.